Last year I started a blog called WomenPaintingWomen.com where I highlight the work of living, realist women painters who use the female subject in their paintings. Amazingly the blog became much more than I had ever imagined, and I soon invited my artist friends Diane Feissel and Alia El-Bermani to help me manage the flood of incredible artists who were being nominated for the site. We now have almost 300 artists represented, we have started a FaceBook page for fans of WPW, and we are planning ways to expand the concept to find new ways to support and highlight the work of contemporary women artists. Earlier this year I was contacted by the Robert Lange Gallery in Charleston, SC, who decided to organize a juried exhibition inspired by the theme of my blog. 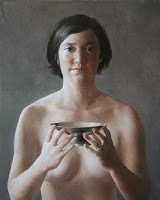 As you can imagine I was thrilled, and even more so when my piece "Mary with Silver Dish" was accepted into the show. The exhibition will showcase the work of almost 50 women artists. I will be at the November 5th opening at Robert Lange, I hope you can join us, 5:30-8:30pm. The list of all participants is on the gallery's blog. It's an incredible group of artists and I am sure we will all be inspired by one another! I am amazed and touched by how my initial idea has sparked a growing movement, and I'm looking forward to seeing how Women Painting Women will continue to evolve. Finally, in a serendipitous twist, M Gallery where I show my work in Florida has recently moved to Charleston, and my ARC award-winning painting "Bottle Collection" will be on display, including others soon. I'm excited I'll be able to visit M Gallery's new location in person when I visit Charleston in November! Congratulations Sadie-it sounds like a wonderful show! And I envy your time on Sullivan's Island- have fun and good painting! I'll check out the show when I'm in Charleston that weekend. I hope I can meet you. I have a show at M that evening. Great that you are all renting a house for a week. It's such an explosion of creativity when I do that with my friends. Frank I look forward to meeting you! !